For the first time, you’re more likely to be using an Android operating system to read this piece than Windows. 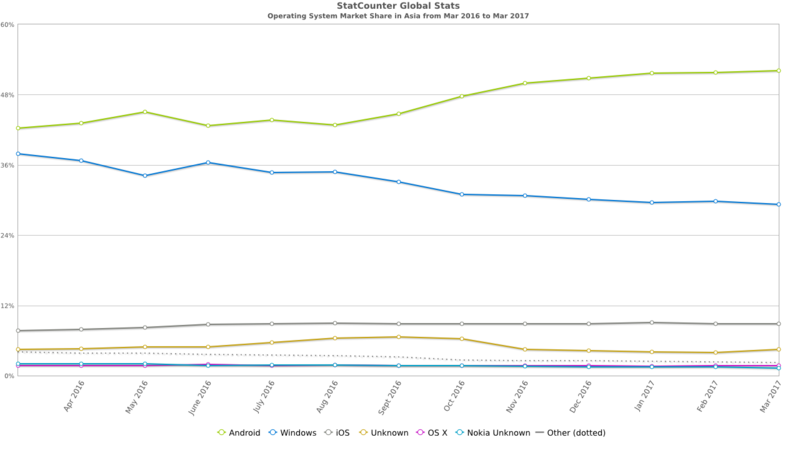 In March, Android’s market share ticked over to 37.93%, pushing its little robot nose ahead of Windows by just 0.02%. 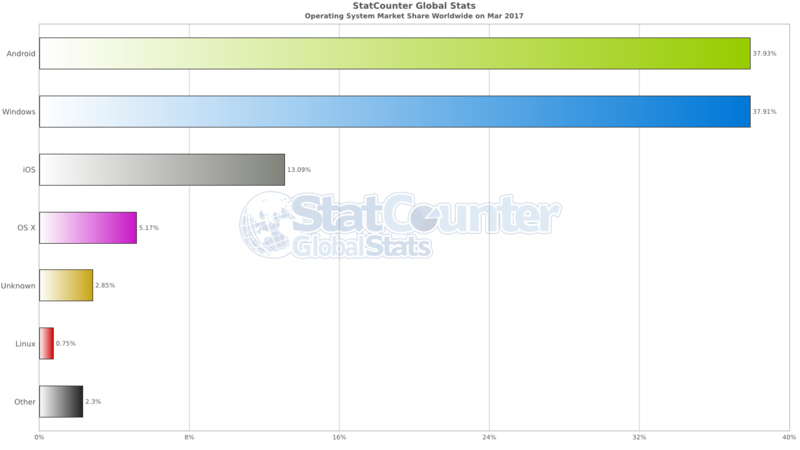 Data from StatCounter - a web analytics service - shows iOS and OS X trailing some distance behind. Android’s position at the top caps a remarkable rise. 5 years ago the Google owned system claimed less than 2.4% of the pie. And Microsoft? More than 80%. Breaking down the data a little shows just what’s behind Android’s surging market share. Although Windows remains the king of desktop, Android reigns in the world of mobile with a 71.5% share. Last year, for the first time, mobile devices were used more than desktops to browse the web . This reflects a broader trend of rising smartphone usage. As the popularity of mobile has increased, Android has been well placed to take advantage. Its source code is free to use for any hardware manufacturer, so it’s used in a variety of smartphones - at a variety of prices. 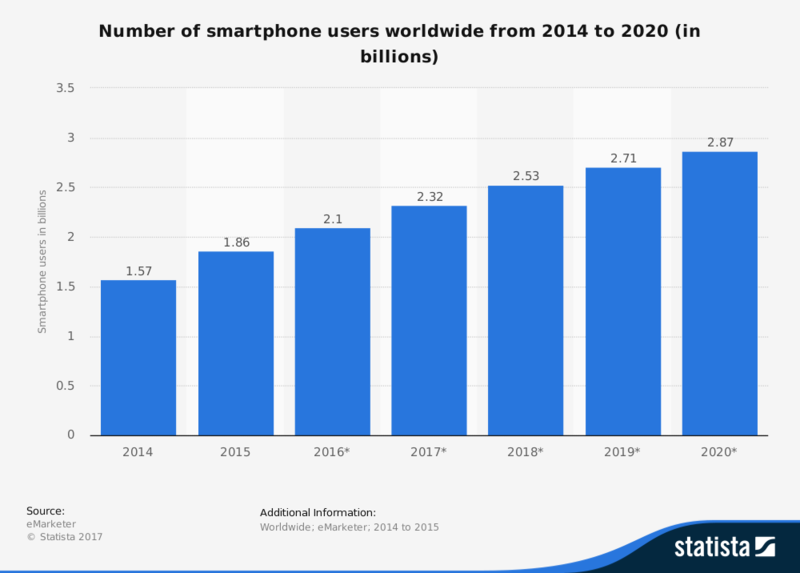 A Pew Research Center report from last year highlights the increasing use of smartphones in emerging economies. Between 2013 and 2016, ownership rates increased by 42 percentage points in Turkey, 34 in Malaysia and 26 in Chile and Brazil. China has also seen a significant rise in ownership . 68% of adults reported owning a smartphone last year, compared to 37% in 2013. There are big differences between regions of the world that highlight the growth of mobile over desktop in emerging economies. In Africa and Asia, Android is the most popular operating system. Today, Android claims more than half of the market share in Asia, with Windows less than 30%. But, just a year ago, things were much closer. Conversely, in Europe and North America, Windows remains the dominant system - although with a declining share.